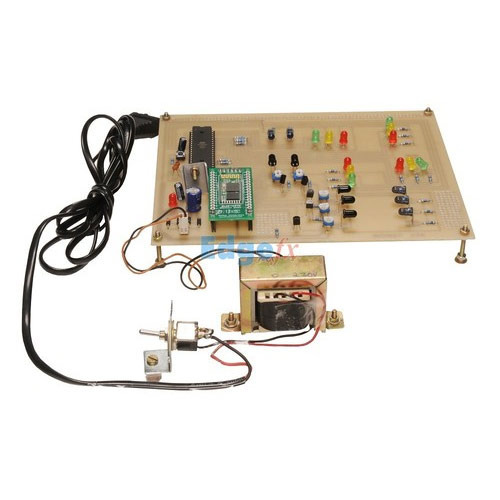 Android Project Kits offered by our organization is available in the range comprising Remote Alignment Of 3D Dish Positioning, Four Quadrant Operation Of DC Motor and others. This is able to work in the excellent manner for long time. Density Based Auto Traffic Signal Control With Android Based Remote Override: Remote override control of density based traffic signal by emergency vehicles like ambulance,fire brigade etc for getting priority in the desired direction through remotely operated commands to a microcontroller by touch screen based user friendly GUI on any smart phone with Android applications. Street Light That Glows on Detecting Vehicle Movement: The project is designed for LED based street lights. A number of LED street lights glow for a specific distance ahead, on sensing an approaching vehicle and then switches OFF once the vehicle passes by. Thus a lot of energy is saved in this process. Optionally, dimming feature can be used in this system while no vehicles are passing on the road. Remote Alignment Of 3d Dish Positioning By Android Application: The main application of using a dish antenna to position it to the exact angle by remotely operated commands to it by touch screen based user friendly GUI from any smart phone with Android applications. Four Quadrant Operation Of Dc Motor Remotely Controlled By Android Applications: The project has been designed to develop a speed control system for DC motor in all the four-quadrant. Using four-quadrant chopper it is possible to demonstrate forward, instant forward brake, reverse, instant reverse brake control of a DC motor using a microcontroller through remotely operated commands to it by touch screen based user friendly GUI on any smart phone with Android applications. Fire Fighting Robot Remotely Operated By Android Applications: The project is designed to develop a fire fighting robotic vehicle using motors those are interfaced to a microcontroller through remotely operated commands to it by touch screen based user friendly GUI on any smart phone with Android applications. The robotic vehicle is loaded with water tanker and a pump which is also controlled remotely too pump the water on the fire. Remote Speed Control Of Dc Motor By Android Applications: Speed control of DC motor by varying the duty cycle of the pulse applied to it (popularly known as PWM control) through remotely operated commands to the microcontroller in steps by touch screen based user friendly GUI on any smart phone with Android applications. Remote Induction Motor Control By Android Application With 7 Segment Display: Speed control of an induction motor such as fans by a triac interfaced microcontroller through remotely operated commands to it in steps by touch screen based user friendly GUI on any smart phone with Android applications. Railway Level Crossing Gate Operation Remotely By Android: Railway level crossing gate motor ,controlled by the the engine driver from a smart phone to a micro-controller through remotely operated commands to its by touch screen based user friendly GUI with Android applications for deriving an output to dive a relay for the gate motor operation. Remote Ac Power Control By Android Application With Lcd Display: Based on the principle of firing angle control of two thyristors connected in anti parallel is fed for the output from an embedded microcontroller circuit having LCD display. The firing angle is remotely controlled to get reduced load power in steps by touch screen based user friendly GUI on any smart phone with Android applications. Password Based Remote Controlled Door Opening By Android Application: The project is designed to operate a motor operated door interfaced to a microcontroller through remotely operated commands to it by touch screen based user friendly GUI on any smart phone with Android applications.